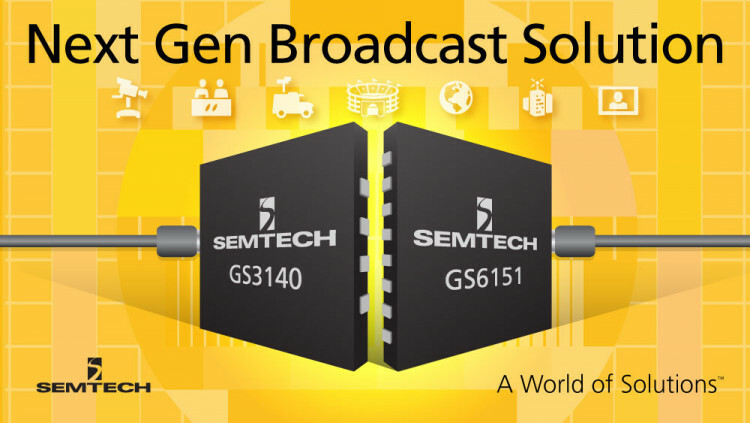 Semtech Corporation (Nasdaq: SMTC), a leading supplier of analog and mixed-signal semiconductors, today announced that its ultra-low power GS3140 cable equalizer and GS6151 reclocker are utilized in the UMC-E00E-4-SFP universal media converter from Nevion, a leader in media conversion and transport solutions to the broadcast television industry. The UMC-EOOE-4-SFP offers flexible conversion between its 3Gb/s SDI, optical, SFP and GbE interfaces. Semtech’s UHD-SDI products feature ultra-low power consumption and provide industry-leading performance at up to 12Gbps rates. UHD-SDI is ideal for UHDTV infrastructures, including routers, cameras, monitors, switchers and more. It offers pristine image quality, is backwards compatible with existing SDI systems, and is standardized by both Society of Motion Picture & Television Engineers (SMPTE) and the International Telecommunication Union (ITU), simplifying UHDTV infrastructure upgrades and reducing risk for broadcasters. GS3140 SDI Cable Equalizer: Industry’s lowest power SDI cable equalizer. Ultra-long cable reach for SD, HD and 3G data rates, enabling high performance customer designs with no performance compromises. GS3140 Product Page: www.semtech.com/broadcast-video/equalizers/gs3140/. GS6151 UHD-SDI Reclocker: High performance, low-power 6G reclocker with input signal equalization and output signal de-emphasis to compensate for PCB trace losses, simplifying customer design requirements. GS6151 Product Page: www.semtech.com/broadcast-video/reclockers/gs6151/. The GS3140 and GS6151 are available now for sale. Semtech offers comprehensive design assistance, including field- and factory-based support. Data sheets, volume pricing and delivery quotes, as well as evaluation kits and samples, are available at www.semtech.com/info. From content production to distribution, Nevion solutions are used to power major sporting and live events across the globe. Some of the world’s largest media groups and telecom service providers use Nevion technology, including AT&T, NBC Universal, Sinclair Broadcast Group Inc., NASA, Arqiva, BBC, CCTV, EBU, BT, TDF and Telefonica. All statements contained herein that are not statements of historical fact, including statements that use the words “enable,” expects,” “will,” or “require,” or other similar words or expressions, that describe Semtech Corporation’s or its management’s future plans, objectives or goals are “forward-looking statements” and are made pursuant to the Safe-Harbor provisions of the Private Securities Litigation Reform Act of 1995, as amended. Such forward-looking statements involve known and unknown risks, uncertainties and other factors that could cause the actual results of Semtech Corporation to be materially different from the historical results and/or from any future results or outcomes expressed or implied by such forward-looking statements. Such factors are further addressed in Semtech Corporation’s annual and quarterly reports, and in other documents or reports, filed with the Securities and Exchange Commission (www.sec.gov) including, without limitation, information under the captions “Management's Discussion and Analysis of Financial Condition and Results of Operations” and “Risk Factors”. Semtech Corporation assumes no obligation to update any forward-looking statements in order to reflect events or circumstances that may arise after the date of this release, except as required by law.